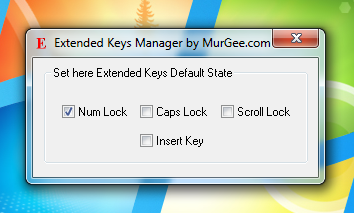 Manage and Control Caps Lock, Scroll Lock, Num Lock and Insert Key on Keyboard connected to a Windows Computer easily with Extended Keys Manager Utility. The Software can be used as an alternative also in case any of the Keys do not work on a Keyboard or even on a Laptop Computer. The Screenshot below displays the Screenshot of the Software taken on a Windows 7 computer. The Extended Keys Manager utility has check boxes for each of the keys which can be controlled with the software utility. As displayed below the checkbox marked with Num Lock is checked which implies that when the software utility was started, the Num Lock was enabled. The Setup of the Software utility also adds the software to Windows Startup so that whatever keys you check will be on and corresponding LED on Keyboard will be lit (apart from the Insert Key which does not have an LED on the Keyboard). With Windows 7 onwards computers such as Windows 8, any application can be pinned to the Taskbar. In case you do have a keyboard on which either of the Num Lock, Caps Lock, Scroll Lock or Insert Key does not work, this software can be used as an alternative. In case you do not want the software to be started at startup, you would need to manually remove the corresponding entry in the registry using msconfig or any other appropriate tool. The Software has been tested on Windows 7, Windows 8 and even on Windows XP and it sets up the keyboard keys as configured in the Extended Keys Manager Utility. The software utility is a shareware application which implies that you are free to download the utility and try it until the evaluation usages of the software utility are completed. Yes Keyboards are now a days really cheap to buy, however changing keyboard on a laptop computer can be avoided using this software utility as an alternative to broken Caps Lock, Num Lock, Scroll Lock and Insert Keys. In case you do want to control any other key on your keyboard with this software utility an email to the support team can do the job. Although the setup adds the application to startup, the application is supposed to only set the states of few keys on keyboard and hence it exits automatically from the memory. During the software installation, you will have an option to create a shortcut on Desktop with which you can launch the software or you can even launch the software utility from the programs menu. Controlling Scroll Lock, Caps Lock, Num Lock, etc keys can be really easy with this software application, just check or uncheck the appropriate checkbox and the software will do the job irrespective of whether the keys work fine on your physical keyboard or not.